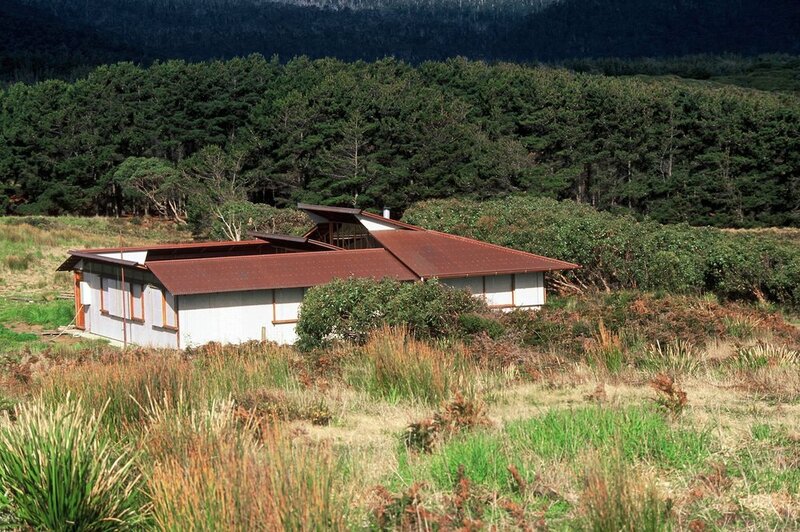 Cloudy Bay Retreat, Bruny Island, Tasmania, Australia : 43˚S : Completed 1996. Richard Leplastrier with David Travalia. The site looks straight into the teeth of the Roaring Forties and the next stop south is Antarctica. To build here is to look for the lee, and this small house, which was built as a retreat for study and meditation, has definite vessel qualities. The forms are inspired by the wind-sheared landscape leaning back at 60 knots. The siting is as low to the ground as possible and the roof form resembles the spray dodger on an ocean-going yacht. The house is like an oyster: rough and tough on the outside, but smooth and polished on the inside. The house was built by Jeff Broadfield and a team of students from prefabricated timber panels trans-shipped to Tasmania from Sydney.